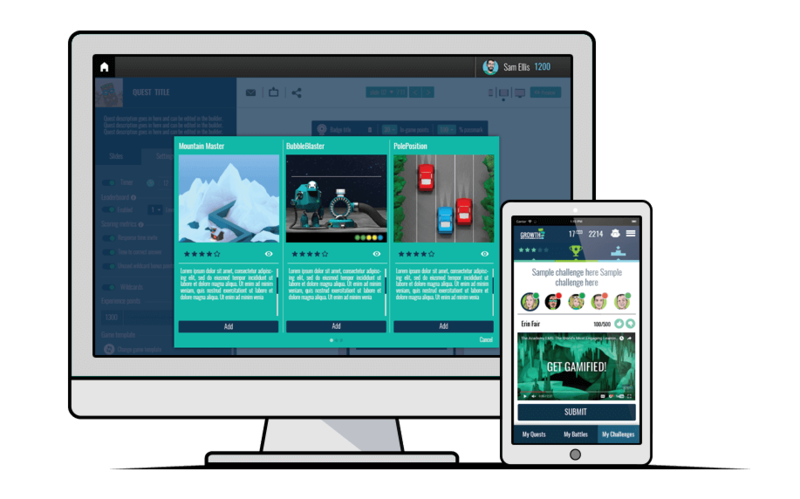 <h4>What is Genie?</h4> <p>Genie is a simple, intuitive authoring tool that lets your team create and export learning games and micro learning content. Its innovative blend of rapid content authoring and learner engagement enhancements make it the perfect solution for today’s training professionals. </p> <h4>Who is it for?</h4> <p>Genie is designed to make it easy for anyone to create learning games, even if they have no technical expertise. Because of its speedy build process, it’s ideally suited to micro learning campaigns and providing just-in-time learning solutions. </p> <h4>Mobile Ready</h4> <p>As more and more people now prefer learning on mobile devices, Genie is optimised to help instructional designers and content creators build learning assets that provide a flawless mobile experience. </p> <h4>LMS Ready</h4> <p>Genie allows your L&D team to export learning games in a format that your learning management system supports. This gives you full visibility over how your learners are interacting with the content. With Genie, you don’t need any technical expertise. All you need to do is slot your content into slides, select a game template, and the system will create an engaging learning game. This simple colour-matching game is a mobile gaming favourite and now you can use it to support your training programme. You can even match the colours to your own brand (see: Template Re-Branding). Speedy reactions and good hand-eye coordination are needed for this mobile spin on a classic fairground attraction. Learners can pause to catch their breath with unlockable learning assets. You can make the learning more effective by aligning it with your organisation’s brand and objectives. Our team of designers can create the ideal learning game, skinned for your learners. In Mountain Master, your learners can test their reflexes on their mission to get to the top of the mountain. As they pass each checkpoint, they’ll unlock a vital piece of learning content. Make learning more exciting by turning it into intergalactic gauntlet. Your learners can now pilot a spaceship, collecting as many learning assets as they can before they’re destroyed by a meteor. If you have an idea for something that will get your learners excited, our developers can create a learning game that does exactly what you need it to. Contact us today to get started. Gamification makes everyday tasks more compelling by adding game mechanics like badges and leaderboards. These features keep learners returning again and again to complete more content. With Genie, you can create an entire library of virtual rewards for every occasion. Upload your own image, give it a catchy name and description, then use it in any of your learning games. Used in conjunction with the Academy LMS or the Knowledge Arcade, each of your learning games can have its own leaderboard letting every learner see how they compare against their team mates. Experience Points (XP) can act as a virtual currency for your learners. Genie lets you switch this functionality on and award points to learners who complete learning objectives within the game. Genie gives you many options when it comes to assessing your learners’ performance using the latest techniques and standards. You can fill your Question Bank with multiple choice questions, arranged in categories to suit your needs. With multiple licenses, you can also invite your subject matter experts to create questions. With this question type, the question creator can specify a correct answer in text form. The learner must input the same text in order to get positive feeback when they submit their answer. For each question in Genie, you can attach further learning assets. These are released to the learner if they get the question wrong and let you deal with the knowledge gap on the spot. This question type adds an extra level of interactivity. It lets your instructional designers create groups of items and ask your learners to place each item in the correct group. This versatile question type allows you to create units with dynamic text which changes according to learner inputs. The learner can also download their answers in a workbook at the end. Genie’s range of export options allow you to analyse and track your learners’ progress and discover which content is working for you. When used in conjunction with the Academy LMS or the Knowledge Arcade, Genie’s content types let you report on the metrics that matter and discover which content is working for you. Genie’s learning content is created to make use of the latest eLearning standards, like xAPI, giving you a more complete picture of their behaviour than ever before. You can use Genie’s reporting tools to filter your results down to the level of individual questions. This gives greater flexibility and lets you build your own custom reports. 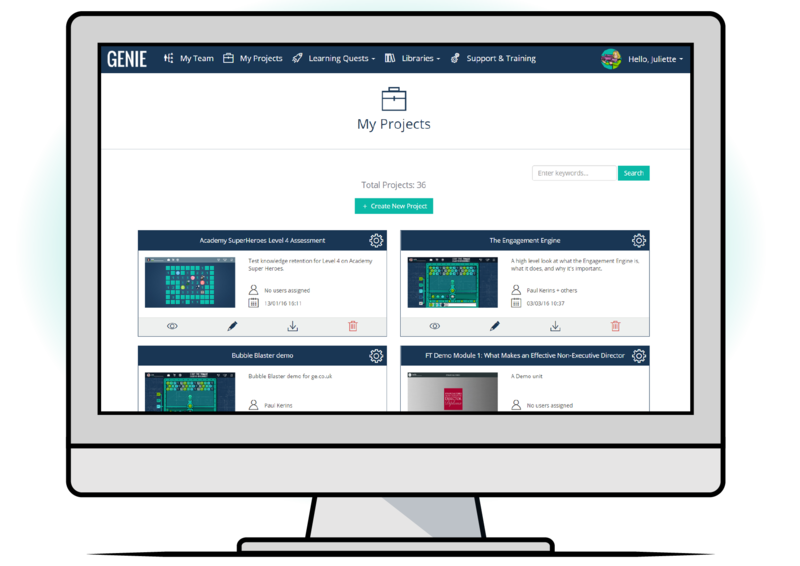 Genie has all you need to give your learners a varied learning experience, letting you support your training programme with a range of different content types. Your team of content creators can upload image files and arrange them by category in the Asset Library. This lets you support your learning units with photos, charts and eye-catching infographics. Genie contains a lightweight audio player, letting you upload and use audio files in your units. This means that you can include voice samples, interviews or even entire podcasts in your training. Genie’s learning units support the most common types of video files (mp4, mpg). Content creators can manage the videos in the Asset Library and add them to any learning unit they produce. Using the question feedback settings, training managers can push assets to learners with gaps in their knowledge. These can include documents, like PDF files, which can be managed in the Asset Library. Genie’s Discovery Method tool helps your learners create their own content as they learn. Prompts throughout the unit ask for learner inputs. These are gathered in a PDF document which the learner can then download. Creating learning content has never been easier with Genie’s intuitive design, and its powerful authoring features help create effective training units. Genie’s builder area includes a handy toggle which lets the content creator preview their unit on a range of different devices, making it easier to create fully responsive eLearning. Whatever learning management system you use, Genie lets you export your learning games in a format that will let you get the most out of them. Genie’s eLearning package exports currently support SCORM (1.2 and 2004), xAPI and CMI5 filetypes. Genie is designed with full project management capabilites. You can add additional administrators and creators, and limit their permissions in the Role Editor. When you buy Genie as part of the Knowledge Arcade mobile learning package, you can manage your own micro learning campaigns. This lets you schedule your micro units and create an experience of sustained learning. Used in conjunction with the Academy LMS, you can arrange your learning games in a hierarchy of Levels. Here, learners must demonstrate their understanding of the topic before they can progress to more advanced content. Growth Engineering’s dedication to customer support means that your training plans won’t be delayed by any technical issues. If you encounter any bugs or technical issues, you can submit a ticket in the Support Centre. A member of the Growth Engineering support team will ensure that your issue is dealt with as soon as possible. On your first visit to Genie, the quick setup wizard will guide your through the application, showing you where everything is and how best to use it. If you need a little help, you can access Genie’s tutorial videos at any time. These handy demonstrations show all of Genie’s main features and how best to use them.